My baby is three years old. His birthday was this past Sunday. My baby isn't really a baby anymore. He's the first one to tell you that. "I not a baby, I a big boy," he proclaims. It seems impossible. In some ways I feel like it was five minutes ago he was a newborn. In other ways, I can't believe he's not 15. A lot of life has happened in the last three years. My baby, my little big boy, Wade, is a funny kid. He's the stereotypical baby of a big family--we let the rules bend a bit for him, he farts to get attention and he'll do anything his big brothers and sister tell him to do. And yes, all of this scares the hell out of me for his teenage years. I've always loved baby Wade, but life with three older kids has been so busy since he arrived. It's been challenging to really be there for him like I was the other big kids when they were babies. We drag him from one sporting event to the next. He watches big kid shows, plays big kid games and says more big kid words/phrases than most two-year-olds. He's never really had a schedule set in stone or a regular nap time. I worry. I worry that he's missing out. I'm filled with guilt. The other day, I pointed to a picture of Clifford the Big Red Dog and he had no clue. He'd never heard of f&#*ing Clifford? Yet, he can name every character on Disney's Good Luck Charlie? My heart sank, I felt like a failure as a parent. So the next few days the house became Operation Clifford--I found all the old books and DVR'd the cute little Clifford shows on PBS. "I yike Cwifford," he announced the other day. Mission accomplished, motherhood status back to adequate. Phew. Now that the older three kids are in school all day, he and I are buddies. Since he has decided naps are for babies, we are together all day long without any breaks. I'm not complaining, which honestly I find a little shocking. I get a kick out of his kind of funny and you know what? I "yike Cwifford" too. Baby, I mean big boy, Wade helps me slow down a little. He reminds all of us to keep life a little more simple. On the days when I am feeling less than adequate as a mother, sometimes it's not just Wade, but how the others take care of him, that remind me that everything is better than fine. When I watch my other children reach out and care for him when he's hurt, read a story to him at bed time or simply sit and watch Clifford with him it makes my heart swell with love. I lose the guilt. Wade is a sweet baby/big boy. He's a Hot Wheels obsessing, set up making, joke cracking, Monsters Inc. loving, tricycle riding, amazing little three-year-old wonder boy. He is a sweet exclamation point at the end of our family. Wade's a cute kid and I sure do love him, but like I said there have been times when the last three years feels like it's been more like 15. I'm tired, people, and my eyes are showing it. That's why I'm trying Rodan + Fields Anti-Age Eye Cream. I've heard amazing things about it. I'm trying it and now you can too. 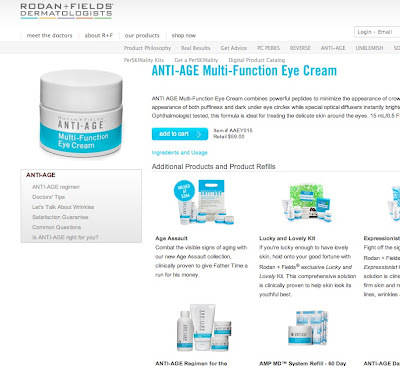 Leave a comment here and you'll be entered to win ANTI AGE Multi-Function Eye Cream - which retails for $59. The cream "combines powerful peptides to minimize the appearance of crow’s feet, help reduce the appearance of both puffiness and dark under eye circles while special optical diffusers instantly brighten the eye area. Ophthalmologist tested, this formula is ideal for treating the delicate skin around the eyes." Yup, that sounds about right. Leave a comment and you could walk away with some pretty amazing sounding eye cream. Leave a comment here and you could win. ok, no question: I need this stuff! Happy Birthday Wade!Sorry I missed Sunday Ang (again).